S1097, White Color, Shimmery Finish Paper, Scroll Invitations, Jewish Invitations. Long Scroll. 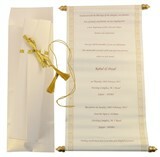 Box has gold ribbon while the scroll has gold bars and is tied with golden tassel. Envelope is plain.